Emma Sidi is obviously a talented character actor. She commands the small stage with ease, connecting comfortably with her audience. Energetic, warm and dramatic, it is hard not to like her. Despite this, her material has some serious issues. The structure doesn’t work. She has one main character, who reappears several times and takes up a significant portion of the show. There are then two other characters, who each get one segment. To feel more coherent as a piece, I think either more characters would be needed, with Sidi able to grapple with much shorter segments, or the few characters there are would need to repeat. Most frustrating, however, is her reliance on accents to drive humour. Of course, in character comedy, the voice is an instrument, and one of the ways in which comedians can distinguish between their creations. Still, several of Sidi’s characters rely heavily on their accents for laughs, in lieu of actual jokes. This was a particular problem for Vanessa, a Mexican character in a highly dramatic and tense situation, telenovela-style. If big laughs rely on finding her pronunciation of “vivid” hilarious, there is a problem. Sidi may be well-meaning but this humour is designed for a cheap laugh; her stage persona deserves better material. 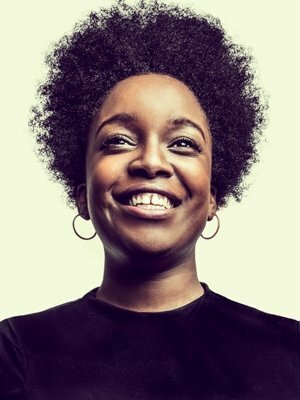 Lolly Adefope is back for the second year at the Edinburgh Festival Fringe but it feels like it could be her tenth. She is a performer with great confidence and stage presence, bringing the audience a polished and snappy show. This is what character comedy should be. Adefope is expressive and exact, giving us distinct, funny scenes. Some of them make incisive social commentary; topics include auditions for black actors, life as a minority in a British university and playing the race card. 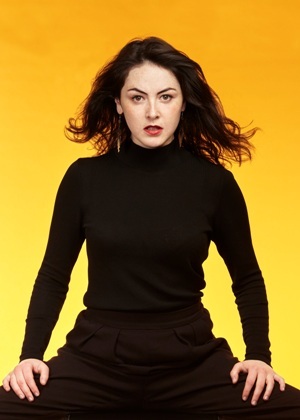 Perhaps her most cutting material is commentary on her performance itself as she points out in frustration the double bind of being a comedian of colour. If she ignores race, people wonder why and say it’s a shame, but if she uses it in her material, they complain that it’s all she talks about (regardless of how many other topics she includes). 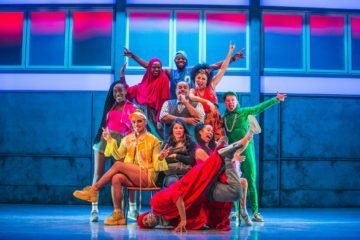 Whether she is using her comedy to criticise racism or creating characters who are simply funny without an underlying message about society, Adefope is incredibly talented. The show flies by. 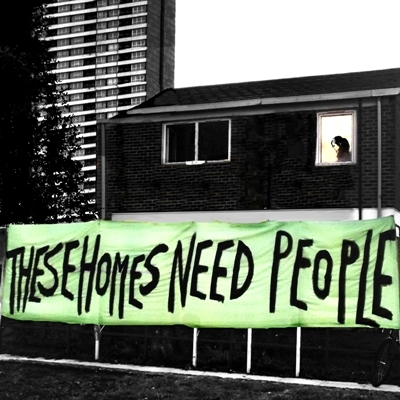 Three years ago, 29 young mothers living in social housing in Newham were evicted and told they would either have to pay private rents in London or be moved to housing in other cities, away from their families, friend and communities. Their existing housing was to be turned into private flats. E15 is the story of women coming together to campaign and protest. It has been created in collaboration with those involved, many of whom were interviewed and whose words are given verbatim. It is a conflicting mixture of inspirational and demoralising. It is heartening to see the successes of the group, who manage to secure some guarantees and social housing places off the back of their grassroots movement. What can’t we do when we come together? But this is tempered by a sense of the scale of the problem and the temporary nature of the solution. What happens next? How many more will be uprooted from their homes? Strong performances from a talented cast ensure that E15 conveys a clear condemnation of the current state of social housing. I loved Vicky Araico Casas and Nir Paldi’s co-written one woman show Juana in a Million, a deeply absorbing and affecting story of a Mexican immigrant trying to live under the radar in the UK. Therefore, I was greatly looking forward to their newest collaboration, Bucket List, which focuses on the impact of the North American Free Trade Agreement (NAFTA) on people in Mexico. Unfortunately, the show misses the mark. Although the talented ensemble work hard, demonstrating sophisticated storytelling techniques, it doesn’t add up to enough. Criticism of NAFTA may be valid, but the dots need to be joined a lot more. A combination of telling the story through the eyes of a child and the fact that much of the show was a hallucination leave us uncertain what to believe. I certainly feel that there are some great wrongs that need to be righted by the end, but it’s a vague, undefined feeling that I find hard to express. The magic realism and lack of detail simply don’t work when it’s apparent that the company want to call for change, but both violent and non-violent action are shown to be hopeless. What would that change look like and how could it be achieved? Bucket List won’t tell you. Leah is a bubbly young woman who seems to have it all. Working as a shop assistant in a high end tailors on Savile Row, she finds out she has been promoted on the same day as meeting her future husband, a wealthy, handsome man who she falls for immediately. This is a one woman show telling Leah’s story, which soon reveals that things aren’t as perfect as she lets on at the start. Nancy Sullivan is captivating as Leah. She is engaging and compelling as she conjures scenes from her life, making them as vivid as if there were a much larger cast. The story she tells is difficult. At its heart are issues of gender and power. Leah’s relationship with Ben starts with her serving him in the shop and this power dynamic remains, coloured both by gender roles and their class divide. Leah loves Ben but she also feels obliged to follow his orders and anticipate his needs. Her description of one of their sexual encounters demonstrates how complicated consent can be when power is so uneven. These themes develop throughout the play, with increasingly disturbing manifestations. Fabric is a tale that is all the more tragic because it sounds so true. Although distressing, it is an excellent performance. Image 1: From Emma Sidi: Telenovela, used with permission. Sidi is photographed in all black staring fiercely at the camera. Her dark hair is being blown backwards by a wind machine and her hands are on her thighs. The background is light orange. Image 2: From Lolly 2, photograph by Idil Sukan/Draw HQ. A head and shoulders shot of Adefope. She is looking upwards and laughing. She has afro hair and hoop earrings. Image 3: From E15, used with permission. A photograph of a banner outside some buildings. There is a two storey house in front of a high-rise block of flats, they are in black and white. In front of them is an acid green banner with “These Homes Need People” written on it. In one of the windows of the house a figure of a woman can be seen. Image 4: From Bucket List, photograph by Alex Brenner. 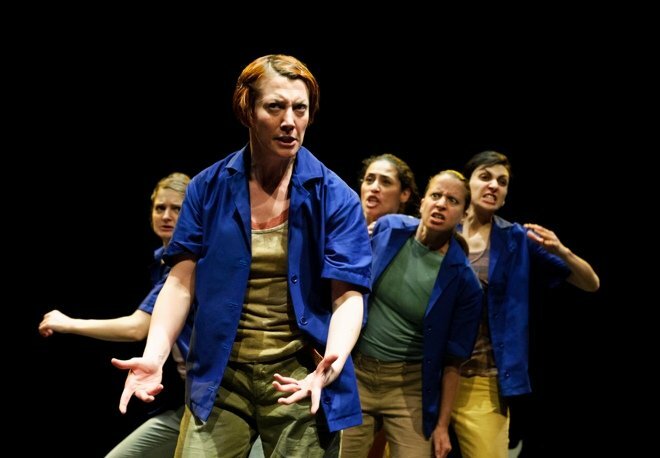 Five women can be seen, each with a look of intense concentration and emotion on their face. One woman is in the foreground, with the other four all visible behind her. Each wears a bright blue short sleeved shirt over a top and trousers in various muted colours. Image 5: From Fabric, photograph by Pamela Raith. 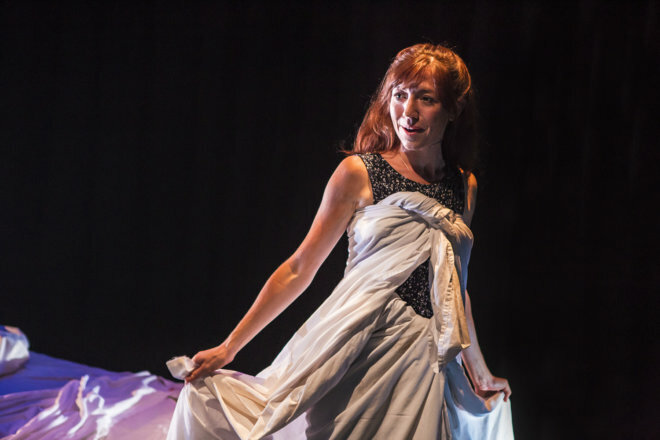 Nancy Sullivan as Leah is to the right of the photograph, she wrapped in sheets which are tied across her front and around her middle as if they’ve been constructed into a dress. She’s holding out the sheets slightly behind her, and is looking down and to the right. It looks like she is speaking.